The last time I did ice cream cone cupcakes I took a traditional chocolate and vanilla approach. These cupcakes were tailored for a garden brunch hence the lavender and rose frostings. I used a simple syrup to flavor the frosting. This technique can be used with any herb, spice, or edible flower and you can use any leftover simple syrup to make cocktails… a very handy technique with a great upside. Just how far to fill the cone is very dependent on the recipe. The last time I made them I had some overflow. So, this time I was conservative and ended up with some extra room. So fill at your own risk. I recommend just over the ridge for the recipe below. 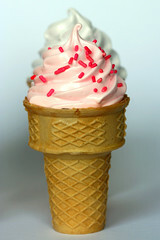 My take on ice cream cone cupcakes is this. They are very cute, no doubt, but not practical when it comes to eating. It is near impossible to get frosting and cake in the same bite without ending up with a bunch of frosting on your nose. The cone also ends up on the chewy side. So while they make a great presentation, I will stick to regular cupcakes when taste matters. 1. In the bowl of an electric mixer fitted with the paddle attachment, cream butter and sugar until light and fluffy, about 2-3 minutes. 2. Add eggs, one at a time, beating until incorporated. 3. In a medium bowl, whisk together flour, baking powder, and salt. 4. Measure out milk and vanilla. 5. Add flour mixture and milk alternatively, beginning and ending with flour mixture. 6. Mix in lemon juice. 7. Fill the ice cream cones about 1/2 inch from the top (just over the lower ridge). Tap the cones to ensure the batter fills the bottom. Bake at 350 for 20 minutes until a cake tester comes out clean. I used the sturdy cupcake papers as holders for the ice cream cones. While they stand on their own, it is a bit easier to transfer into the oven with the cupcake papers. Simple flip the papers and cut an X into the bottom. Stick the cone into the X. 1. Add sugar and water to a small saucepan set over medium high heat. 2. Heat the mixture until the sugar dissolves, stirring occasionally with a wooden spoon. 3. Stir in lavender and let the mixture sit over the heat, undisturbed for 3 minutes or until thick and syrupy. 3. Stir in rose petals and let the mixture sit over the heat, undisturbed for 3 minutes or until thick and syrupy. 1. Whisk the egg whites and sugar over a water bath in the standing mixer bowl until it reaches a temperature of 110 degrees fahrenheit. This only takes only a couple of minutes. 2. Transfer to standing mixer and whisk using whisk attachment at high speed until soft peaks form. 3. Remove half of the mixture and set aside. 4. With the mixer on medium speed, drizzle lavender syrup into the mixer. Beat on high until stiff peaks form. Add food coloring, if desired. Remove from the mixer bowl and set aside. 5. Return the other half of the mixture. With the mixer on medium speed, drizzle rose syrup into the mixer. Beat on high until stiff peaks form. Add food coloring, if desired. 1. Frost cooled cupcakes with a large star tip. hi, i’ve been following your website for awhile now and just had to tell you your cupcakes look amazing and i want to be you when i grow up. Too cute. 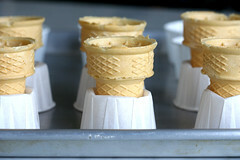 I made ginger buttermilk cupcakes in ice cream cones, although had some trouble getting the cones to the oven safely. Thanks for the tip of using the stands, what a great idea. wow your cupcakes look so pretty(: Can you substitute fruit puree instead of the syrup for the frosting? Thank you for the paper cup trick. I have never made these, because I know I am such a clutz I would have batter and cones everywhere. I will definately try the cake recipe, but may do a raspberry frosting. I have been wanting a “raspberry or strawberry lemonade” cupcake for awhile. I watch for your postings and enjoy your recipes!!! Kids will love this idea!! I really like the idea of the cup holders for baking the cones–Thanks.When I use the cups you have I bring a pair of plastic scizzors, to cut a slit in the side ,as some folks found it hard to peel away. How is Naomi growing? We’d love to hear. i have tried out ur earlier experimental receipe, that was very great thanks!!! now seeing another one with meringue… mmm.. would try for another special occasion! i make cupcake cones all the time for parties and people love them. for kids parties i use colored cake cones. i bake them in a cupcake pan and as long as you’re careful, they wont spill over. Doesn’t it seem the best looking things aren’t those with the best taste? Your web-site is such an inspiration to me, and the photos make your creations edible works of art!!! Keep up the great work! they look so beautiful…. almost too cute to eat! The meringue icing was a perfect choice for the “ice cream”! :) These look so refreshing! hi..i need to ask u which vanilla cupcake recipe tastes better..billy or magnolia? im trying to find airy light cupcakes..nt dense ones…any recommendations? OMG these are beautiful!!! I can’t wait to try these. Only the coolest kids had ice cream cone cupcakes on their birthdays…will have to try this one for myself now that I’m all grown up. :) All of your cupcakes always look amazing…love your blog! OMG, they look so besutiful and so artistic. Love your craft. I’ve done these before, but I’d forgotten them until I saw this. I’m going to try your lemon recipe tonight for our office party tomorrow. I’m going with a strawberry cream cheese icing, instead. I really like the holder idea, but I find that a good bit of foil stuffed in the cupcake ring works just as well. Thanks for all the tasty recipes. 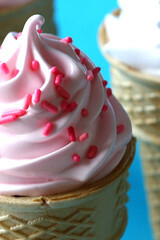 Just realized I had made cupcake cones the same month you did…It is always amazing how connected bloggers minds can be! Meant to add that the lavender rose meringue is just brilliant! I have bookmarked it for future cakes. I am on the prowl for easter ideas and these look fab, but best of all the are making me drool..
How do you pack the ice cream cone cupcakes for travel? It’s not easy. Best if you don’t have to transport. I moved about six and created a contraption with a box and upside down cupcake papers with an x cut in each. Even then it was a struggle getting them safely moved.